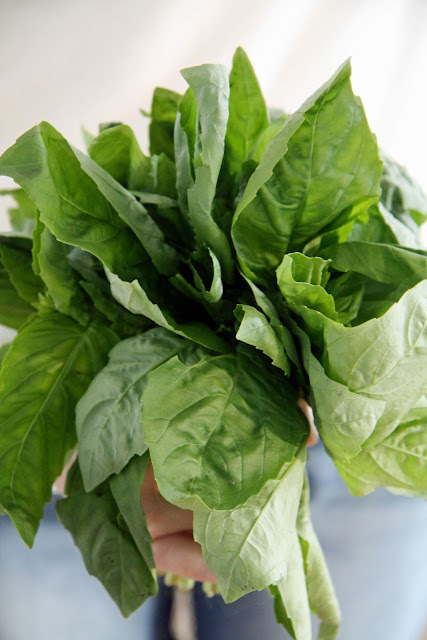 A bouquet of fresh basil has an especially summery fragrance during the winter months. We bought this bouquet, which was grown in a hothouse on an organic farm here in the Pacific Northwest, to enjoy as a mid-winter treat. 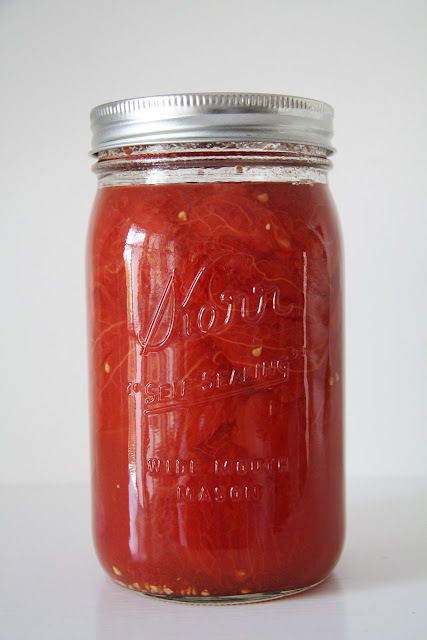 And a jar of garden tomatoes (our last jar canned from this past summer's crop!) possesses an especially sweet summer taste as the cold outdoors whisper nothing but quiet in the still sleep of winter dormancy. One of our favorite meals to make with fresh basil and summer tomatoes is Pizza Margherita. For the sauce, we simmer tomatoes down to preferred thickness. As the tomatoes are simmering, we add salt and pepper and Italian seasonings. Combine yeast, honey, and water in a large bowl. Once the yeast has activated, add salt. Then add flour in 1/2 cup increments and knead until dough is very slightly moist on the surface. 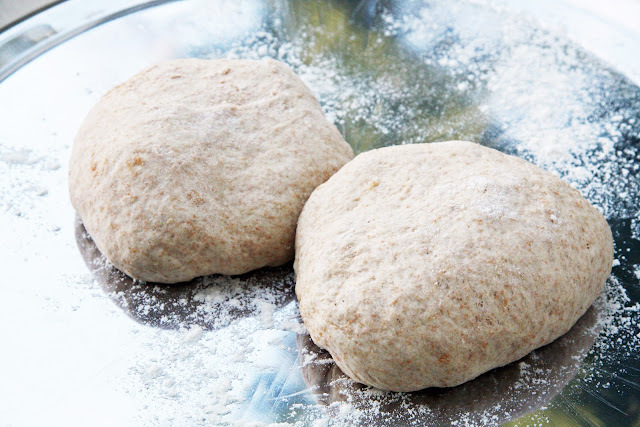 Place dough in large bowl, drizzle with oil, and place in warm spot to rise for an hour or more. Roll out the crust onto floured pizza pan and bake at 425 until just slightly golden. 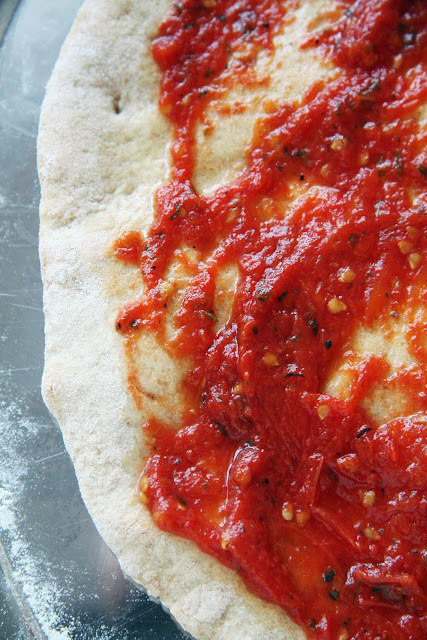 Remove from oven and drizzle olive oil over crust and top with fresh tomato sauce. Top with shredded Italian cheeses. Bake at 425 until done. After reading recent articles such as this one in the Huffington Post, we've held off on buying food packaged in cans. I stopped buying tomato products packaged in cans several months ago but just recently learned that all canned goods may be in danger of absorbing the BPA lining. See New York Times article here. I thought I'd pass the information along to anyone who may be interested. Your making me hungry! It looks lovely. I love the smell of basil. I can't wait to plant it in my vegetable garden and pick my tomato from the plant. It looks delicious. Lovely! Thanks for sharing this...and I have added fresh basil to my shopping list. Authentic and the way pizza's should be made. I bet it was delicious because nothing taste or smell more delicious than fresh basil. I make homemade pizza almost every Friday night. I'm definitely going to start making my own sauce now too... thanks for sharing! Nothing beats a fresh Pizza Margherita! Love a fresh pizza. I miss our basil from the garden, but am fortunate to be able to get it at our local market. A friend had just told me about steering clear of tomato products in cans, but will definitely read the article you linked to. We don't buy much in cans, but I am all for awareness and making healthy choices! this looks fairly easy, especially the crust recipe. i will give this a try! Yum! Basil is my favorite summer smell. The pizza looks heavenly. Thanks for sharing the article. Glad to learn this about tomatoes. Can't be too careful. I can't wait to try this pizza. I usually make the toppings but buy a crust, so I will have to try my hand at pizza dough making! 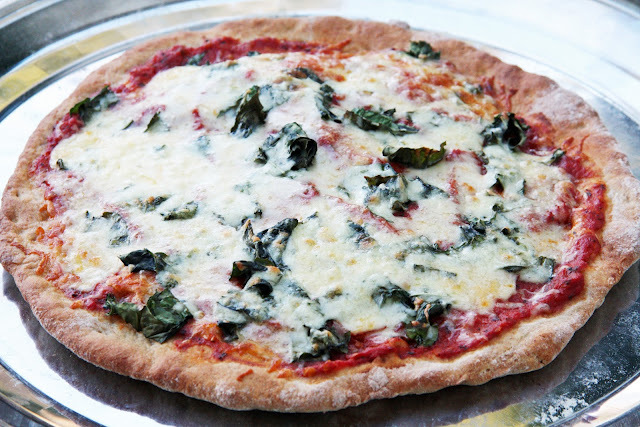 Your pizza crust and recipes look fresh and the best! I hope you don't mind guests . . . 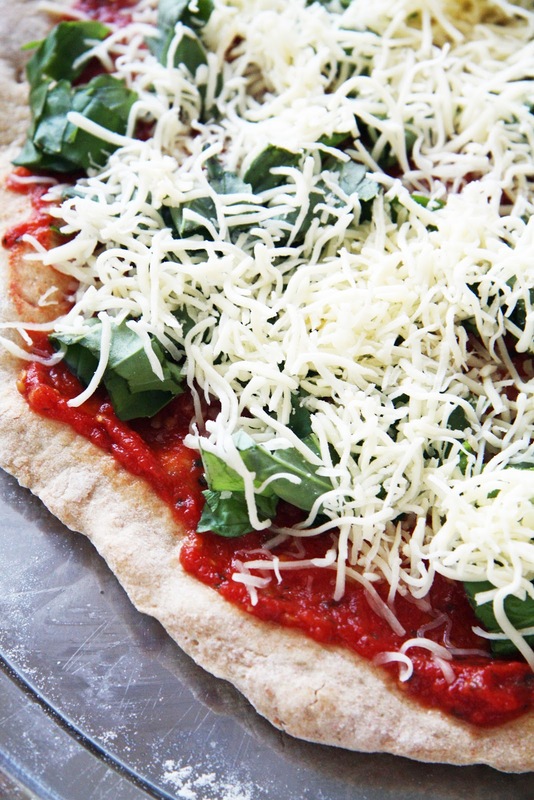 Basil is my very favorite also, and in our house there is nothing better than fresh homemade margherita pizza! Yours look delish! We make a very similar honey whole wheat dough. Just looking at your made me smile. I think we're over due for making pizza. Thanks for the inspiration. Yum... yum... and yum! What time is dinner? Thanks for sharing (and making my mouth water) Have a lovely Monday. Thank you for spreading the word on BPA, used in almost all can linings. How many people are aware of the finding that newborns who have been tested for toxins show more than 200 toxins in their bodies? At birth! Toxins! Our bodies cannot assimilate nor eliminate chemical toxins from our bodies. Many widespread 'diseases' can be linked to these chemicals. Organic garden fresh is the best and your blog and lifestyle are great inspiration! Thank you! I can almost smell that pizza! Yum. I've been keeping a basil plant on my sunporch this winter. I was thinking of stripping the leaves and calling it quits, since it's not very robust. I think I'll make your pizza! I'm ashamed to say that I've never made homemade pizza. When I was in Italy, the Margherita was the best. I'm so happy to find this recipe. You've inspired me! I don't think I could ever go back to processed or canned foods again. It's astounding what toxins and filth go into foods today. More and more, I'm finding I can only eat from my own garden. Thank goodness I like to garden! I meant to tell you before how precious the babies were in the photo of them on the sled...they are just beautiful. My grandmother was apparently justifiably concerned about food in "tin" cans. She always preferred a good ole Ball canning jar for nearly everything. She said she did not trust what she could not see. I guess she was more right than any of us ever knew. She also hated plastic in any form and did not "trust" it either. Even at 98 she was drinking all of her water out of small glass jelly jars...no plastic bottles EVER for her! I knew I should have listened to her! try the Eden Organic canned items..they are all BPA free and you can look them up online, they really stand by their products. Also, being a townhome dweller sans garden, I've had to rely on canned foods unfortunately, but feel OK using Eden Organic, even though it costs a bit more. I also make humous with their garbanzo beans, and get so many compliments and I swear its the product itself that makes it so good. The pizza looks amazing! Thanks for sharing the information on the canned foods. I try to stay away from anything canned and will look up Eden Organic the next time I am in need of some tomatoes. This summer, I hope to have planted enough that I don't have to buy any over the winter. Thank you so much for the information on Eden Organic! Eden does offer a BPA free can for their vegetables, but cannot offer tomatoes in a BPA free can because of the tomato acidity. In recent months they have also started producing tomato products in glass jars. I try to support them and their efforts to produce quality, safe products. We have been enjoying your updates throughout the winter and pouring over your blog for inspiration for our new home. Thank you for sharing your talents with all of us! One thing about this BPA nonsense: a couple year's ago, a friend and i read that even the sealing edge of the popular brands of canning jars have BPA in them. Granted, the dose isn't as much as you'd get in a lined can, however... One brand we discovered that contained no BPA was Weck, from a German company. You can find them for sale at various sites online, and i wouldn't be surprised if you found them in the Portland area. *sigh* Portlanders are so ahead of the game than the rest of us in the Pacific NW. Weck are a bit, well, really, a LOT more expensive, but if collected a little at a time and used habitually it makes it worth it, eh? Eden also offers some of their products in amber glass containers. We just picked up some crushed tomatoes without added salt. Helps cut down the exposure to whatever is in their sealing mechanism. 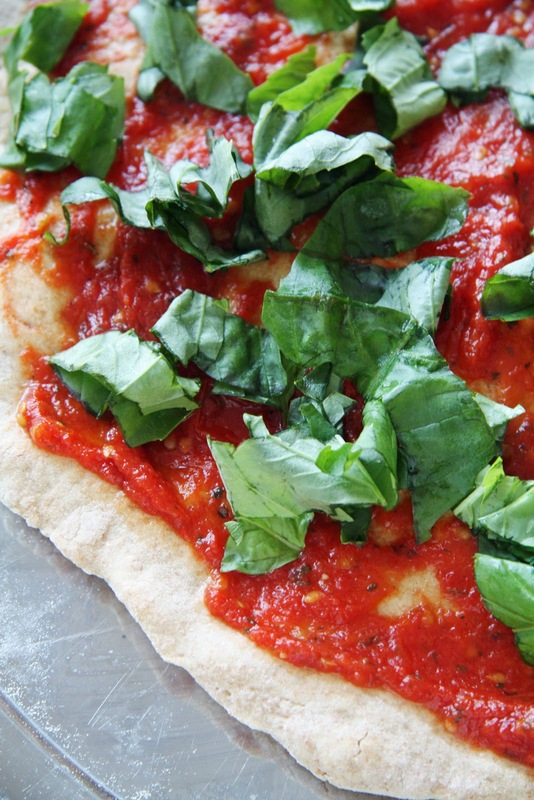 This looks delicious - love homeade sauces and I can smell the fresh basil from here. Beautiful post and pizza inspiration! I love pizza, but here in California we have many organic herb farms, and I also grow many of my own herbs. I like to save basil for the summer. It is something to look forward to, and I can fully enjoy what winter has to offer. 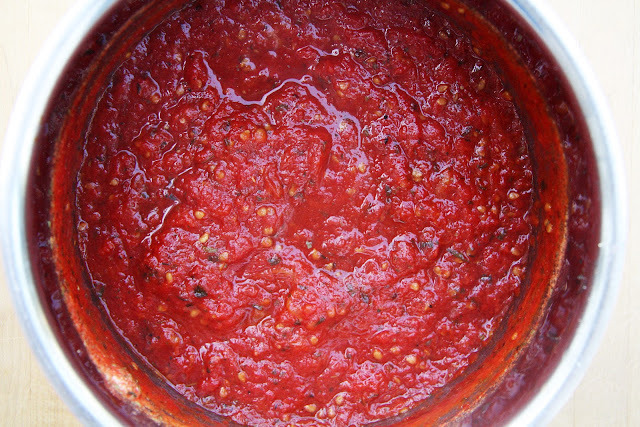 Great idea on the homemade sauces; I cook from scratch as often as I can. That looks so incredible. We are having low-fat fish, brown rice, and vegetables. My husband would like an invite to your house. It makes me happy that you can your own tomatoes! It is the best and safest way! Looks so yummy, I had to make a pizza too. I just wanted you to know that I adore your home and your beautiful taste in decor. I love your nursery. I had the same Jenny Lind bed for my daughter and son (dare I say) 30 years ago. I am to be a Grandmom soon and have borrowed some of your ideas for my little one's nursery at my house. Thanks for your inspiration. I haven't left a comment in so long but as always still enjoy calling in and reading the latest blog post. Interesting you should mention about BPA's. I happen to be watching Dr. Oz today on t.v. and he and some experts were saying this same precise thing. They were also saying they've changed baby bottles as they had BPA's. Still had to work on baby formula as that comes in tins with BPA's on the inside of the tin. The commercial cling wrap that are used to wrap meat in supermarkets etc., contain BPA's but not the cling wrap we all have at home. Good to get the same message although we are half a world away! Someone has probably already said this, but I believe that some cans are BPA free now, though not very many. We also avoid things that come in cans whenever possible. YEEEEUM! Possibel to adopt me? I'll be good. Something else recently discovered, is citric acid in commercial tomato canned good...for the past few years my daughter has had a reaction to citric acid and I never could figure out what citric acid really was...I was just reading Nourishing Traditions and they suggested it is a form of MSG! Why can't They just leave well enough alone?? Your pizza looks lovely and I'm hoping we have a good growing year this year so I can can/freeze my 'maters! Last summer was the worst! This might sound crazy, but since you mentioned BPA, I have been trying to find sealants for teeth that are BPA free. My dentist says he can't find any, but I am determined. Has anyone heard of any sealants that are BPA free and the company's name? Thank you so much for the links, and the recipe. I have been making our own pizza crust with a very similar recipe for years and we can't go back to store bought. I shudder when I think of the boxed pizza dough we used to get from the grocery store, AND all of the canned goods we were brought up on. There is an organic line of food, I can't remember the name, and they boast a BPA-free can. I try to get items from them, but I first and foremost try NOT to buy anything canned. It is truly sobering, scary and...RIDICULOUS. I'm on my second-last jar of canned tomatoes and am using them tonight. I made a ridiculous amount of jam over the fall and canned not nearly enough tomatoes!! I shall change my game plan this year. Also, since this is my first time commenting I just want to say how much I enjoy getting your posts in my inbox. Great information, lovely photos and true commitment to the very same values and ideals I hold, of family, simplicity and health. Great job!! oh my... everything about this pizza just looks like a little bit of heaven! This sounds like a great recipe for pizza, I'm going to make it and let you know how it turns out. Nothing like fresh homemade pizza..could u post the amounts of season that u put in your garden tomatoes. Love your blog. We tend to keep our recipes very simple these days (time is scarce!) so although we didn't write it down, I would guess that we added about a tablespoon of Italian seasoning. Italian seasoning can be found already mixed in grocery stores. Hi Trina, that pizza looks so yummy. I was not terribly successful at canning tomatoes the last couple of summers so what I have been doing instead, is slow roasting them on parchment lined sheet pans; at 250 for about 4 hours. Then I pulse them in the food processor and freeze. The consistancy is sort of like a jam and really packed with flavor. A little goes a long way if you add a store bought tomato sauce to the tomato jam! As always love your posts!